Acts 17:26-27 (KJV); And hath made of one blood all nations of men for to dwell on all the face of the earth, and hath determined the times before appointed, and the bounds of their habitation; That they should seek the Lord, if haply they might feel after him, and find him, though he be not far from every one of us. There are spiritually appointed times and spiritually demarcated boundaries for every child of God. The appointed times work in correlation with the revelation of God’s WORD in our spirits while the boundaries work with the crowns on our lives. The crown is the circumference of your influence in the spirit. God appointed these times and boundaries, that we might seek Him and feel after Him. The more a man feels after God, the wider the boundaries of his habitation, that is, the greater his influence in the spirit realm. God cannot increase the spiritual (and consequently physical) influence of a man who does not FEEL AFTER HIM. This is because if you do not carry the heart of the Father – God, yet have influence over many, the more you will destroy. Take the example of Paul, a man who felt after God enough to spend and be spent for the gospel (2 Corinthians 12:15), a man who would rather be cursed if this would bring salvation to his brethren the Jews (Romans 9:3). For such a man, God put no limit on his boundaries of habitation, that is, his ability to influence men. With confidence, he could say that he is pure from the blood of ALL men (Acts 20:26). Child of God, this is your portion too; it is not only for those who minister on the pulpits. You ought to be the businessman after God’s own heart, the career woman after God’s own heart, the husband or wife after God’s own heart. The more you feel after Him, the more He will trust you with influence over people either in business, career, or even through your marriage. Hallelujah! 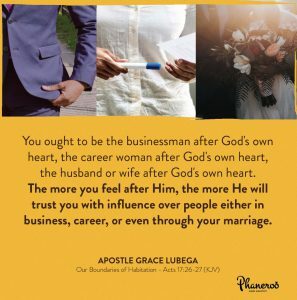 You ought to be the businessman after God’s own heart, the career woman after God’s own heart, the husband or wife after God’s own heart. The more you feel after Him, the more He will trust you with influence over people either in business, career, or even through your marriage. PRAYER: Loving father, I thank you for this great knowledge. Thank you because I am crowned with glory. Your heart is my heart, your mind is my mind and your desires are my desires. I choose to be faithful with those you have placed under my influence, to pattern my life in a manner that ministers your love and grace to many. To the glory of your name. Amen!